Announcing a new bilingual yoga program starting Jan. 7! Our mission at the JP Martial Arts Academy is to bring martial arts to the Jamaica Plain community, for the safety, protection, fitness and enjoyment of the community, families and children. JPMAA has been open and operating at its current location since December 2012. The academy was opened by Dr. David Shim, who has been training in martial arts since 1972. Martial arts is a wonderful and enjoyable form of physical self defense training which has significant impact on one’s physical and psychological health. At JPMAA, we offer programs in Karate and Brazilian Jiu Jitsu in a family friendly atmosphere where everyone is welcome to come and train and have a great time. We provide structured training programs for adults, children, and families, with an emphasis on self defense and attaining positive results both physically, mentally, and spiritually. Our Black Belt instructors have decades of experience, and are competent and caring in their teaching approach. 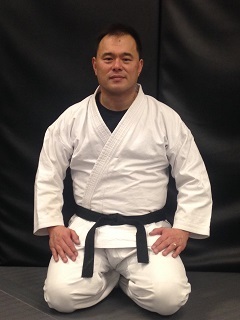 School owner and head instructor Dr. David Shim is a clinical psychologist whose dissertation topic was on the psychological benefits of self defense training. Our student-centered instruction aims to help you reach your physical and self defense goals. Our Karate program has a lineage which can be traced back to pioneers of Karate such as Gogen Yamaguchi, Peter Urban, Richard Kim, and Joseph Hess. The Brazilian Jiu-Jitsu taught at JPMAA has its heritage in the traditions of the Gracie family who developed the art. Our head instructor trained under Professor Roberto Maia of Boston Brazilian Jiu Jitsu who is first cousin to Renzo Gracie. Our programs are technical, proficient, and rigorous, yet maintain an emphasis on enjoyment and health.